My mom ordered me the cutest personalized stationery for the holidays from Rifle Paper Co., a boutique stationery brand and design studio located in Winter Park, Florida. 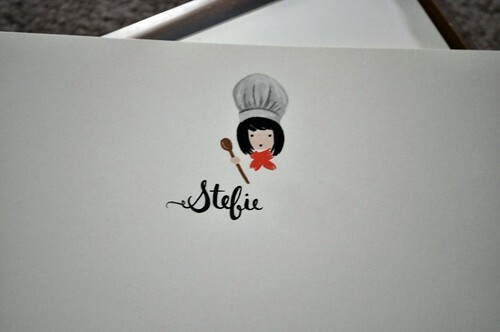 I've been eyeing its custom illustrated personalized stationery for quite some time now, so it was exciting to finally be able to see how this awesome paper boutique could portray little ol' Stefie! These are a few of my favorite things . . ."
The striped twine also reminds me of the ones used to tie the cake boxes at Eileen's Special Cheesecake in Nolita--for something fresh out of the oven, except instead of cheesecake, it's newly printed stationery! 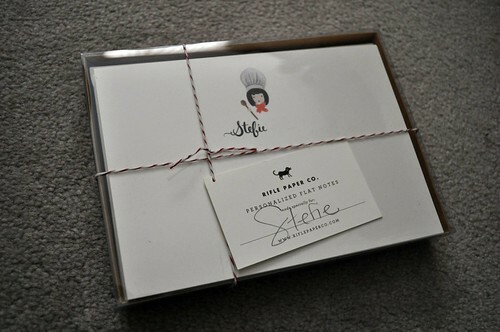 The tag tied to it absolutely makes the packaging--"Personalized Flat Notes made especially for Stefie!" I highly recommended working with Rifle Paper Co. with any of your stationery/illustration customization needs--they are lovely and very easy to work with! I can't wait to begin correspondence with my nearest and dearest on these nifty flat notes, so if you're near and dear, expect some snail mail from Lil' Chef Stefie very soon! Price point: template personalized stationery starting at $75 for 25 flat notes with envelopes, custom illustration for a single portrait at $100 (plus 25 flat cards with envelopes starting at $65). * Please note that my last name is blurred out in the stationery photographs. I LOVE Rifle! Those are so cute! Go Mama K! I looked into having them do my wedding invites, but alas left it too close to the wire to make it happen. Anyhow, send me a notecard! I want to see them! Will do, Shay :) they have beautiful wedding invitations--can't stop ogling them! Thanks, Anna! I absolutely love it :) looking forward to working with Rifle again very soon!